Chasing Davies: Two ways to style rain boots for a rainy spring! 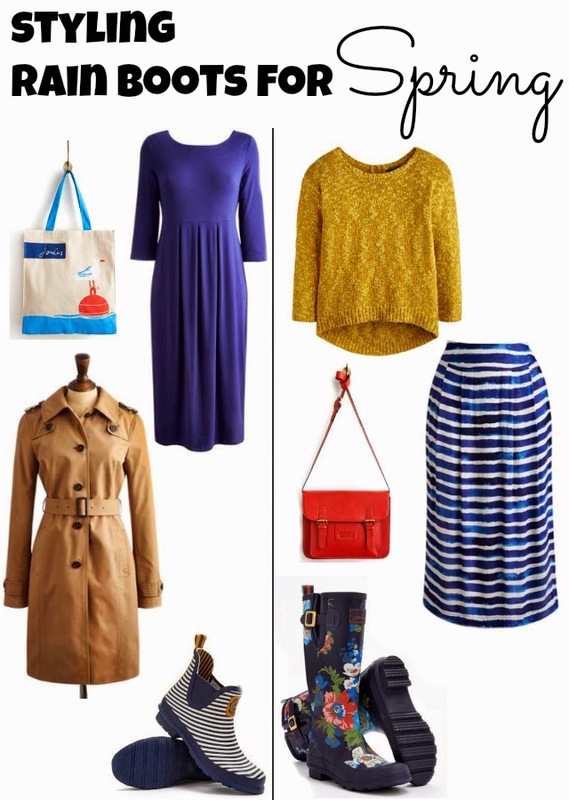 Two ways to style rain boots for a rainy spring! Ok, I don't love rain, but I can appreciate April's showers for the sheer fact that it is not snow. Then comes May (or is it really more like June? ), and all that rain has really paid off leaving a bounty of lush greenery and pretty flowers. And at the end of the day, any excuse to wear cute rain boots is always appreciated. I'm absolutely loving these cute rain boots from Joules, as well as a lot of other pieces from their site. Compiled some of these pieces together and I give you two cute ways to wear those adorable rain boots. Feel free to go stomping through those puddles the remainder of Spring! P.S. They have ridiculously cute kid clothes, too! THIS adorable stripe dress has Nora's name alllllll over it (in like 2 years) and then this polka dot dress should be her Easter dress... in 3 years. And coordinating stripes for Liam, sold! Thank you to Joules for introducing themselves to me, providing me yet another online site for me to stalk, and supporting this site! We always appreciate learning about new shops and working with companies that fit the content on Chasing Davies!